It seems that launching a mini version of flagship smartphones is becoming a regular routine for the South Korean manufacturers, Samsung. Now the manufacturer has confirmed a mini version of its latest flagship Samsung Galaxy S IV. Samsung Galaxy S IV Mini is expected to be rolled out in Europe sometime later in June this year. 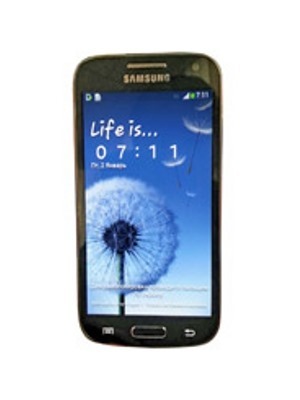 Samsung Galaxy S IV was a much heated topic before its launch. Going by the latest leaked images and specs, Samsung Galaxy S IV Mini looks seem to be following the same path. Samsung Galaxy S4 Mini is expected to sport 4.3 inch qHD Super AMOLED Touch screen that can produce a resolution of 960 x 540 pixels at 256 pixels per inch. Samsung’s earlier flagship product Samsung Galaxy S II also had a 4.3 inch super AMOLED Touch screen. Samsung Galaxy S IV Mini is powered by a 1.6GHz Dual Core Processor, which is likely to be supported with 1GB of RAM. These hardware specs promise a buttery response from the device. Multi-tasking and playing HD Games will be an easy task for this device. The make and type of this processor is still not confirmed. Samsung Galaxy S IV Mini is expected to run on Google’s Android 4.2.2 Jelly Bean Operating System. An update in future will surely be rolled out. Samsung Galaxy S IV Mini will arrive with an 8 Megapixels rear autofocus camera featuring geo-tagging, face detection, touch focus, LED flash and much more. A 2 Megapixels front camera is also expected to be present on the device to support video calls. For Storage, Samsung Galaxy S IV Mini may come in three variants boasting 8GB, 16GB and 32GB of internal memory. It will also carry an external micro SD card slot, which can support a micro SD card up to 64GB capacity. Samsung Galaxy S IV Mini can feature Touch Wiz Nature UX 2.0, which will provide you an ultimate experience of Smartphone interface. This mini variant can also support 4G LTE connectivity, which will be a major advantage of this Smartphone. The latest launched Samsung Galaxy S IV is marking its presence in worldwide market slowly and now the reports of its mini version are driving its fans crazy. Samsung earlier launched a mini version of its flagship Samsung Galaxy S III in October 2012, which is a successful Smartphone by Samsung. The regular Samsung Galaxy S IV is one of the best Smartphone till date by Samsung and its manufacturers are expecting to reach new heights in terms of its sales. Also, the manufacturers are expected to pack Samsung Galaxy S IV Mini with some of the best specs and features devised recently. The Samsung Galaxy S IV Mini will be small in size but Samsung doesn’t want it to lag behind in tough competition from high end Smartphones. If Samsung Galaxy S IV Mini is priced competitively like Samsung Galaxy Grand, it will surely set new benchmarks for the company. As per latest rumors and speculations, Samsung Galaxy S4 Mini Price could be around $450, and at this price, we believe the device delivers a great value for money.